Nothing makes this girl happier than a big plate of hot wings with lots of celery and blue cheese dressing. Once in a great while, it’s a splurge that’s totally worth it…but alas, they are terrible for you, it’s an indulgence that has to be few and far between. 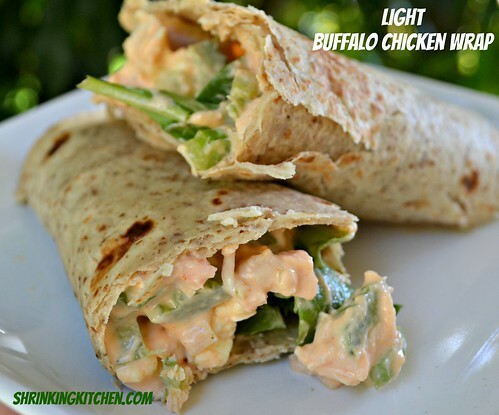 For those times when I’m DYING for wings, these buffalo chicken wraps are just the ticket. It has everything – the chicken, the wing sauce, the blue cheese, the celery. What it doesn’t have is all the fat and calories! Wrap these up and take them out for a picnic in the park! Serve them for a light dinner with a side of fruit. They’re absolutely delicious! Add the cream cheese, yogurt, vinegar, hot sauce and blue cheese to a bowl. Mush and mix together until the mixture is a semi smooth consistency. Add the chicken and celery, toss to coat. Divide the mixture evenly among the tortillas. Pile arugula onto the tortillas and wrap tightly. I did that too. Yum! Definitely making these! I love the flavors of buffalo chicken and blue cheese. Thanks for adding nutrition information for us calorie counters! I made these tonight and reduced the blue cheese a bit since my husband isn’t a huge fan and added 4 more tsp. wing sauce (I like it spicy, and it was too bland to me as is). My husband thought they were a little spicy, I added more sauce and more cheese to mine. They were pretty good!